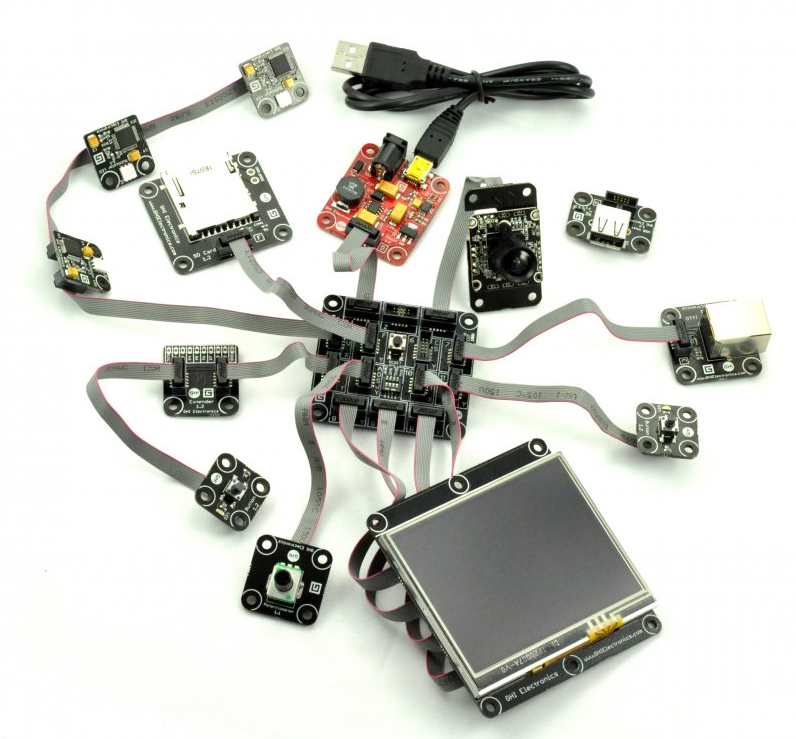 FEZ Spider Starter Kit is the first commercially available .NET Gadgeteer-compatible kit. it includes everything necessary for educators, hobbyists and even professionals. Embedded development is fast & easy (FEZ) thanks to .NET Micro Framework, .NET Gadgeteer and the numerous GHI value added features such as WiFi and USB Host. 10cm IDC cables (included with modules). FEZ Spider Mainboard is a .NET Gadgeteer-compatible mainboard based on GHI Electronics' EMX module. This makes FEZ Spider Mainboard the most feature-full .NET Gadgeteer compatible device in the market. It contains all of .NET Micro Framework core features and adds many exclusive features, such as USB host, WiFi and RLP (loading native code). All these features combine to provide a rapid prototyping platform. Dimensions: W 2.25" x L 2.05" x H 0.5"
Supply voltages are regulated 3.3Volt and 5.0Volt DC. Most EMX software features are GHI exclusive, see software documentation for details.